Location, Location, Location! There are many times when we just long for that peace and rest from the rush of everyday that a good holiday can bring. The brochures promise seclusion and tranquility only to find when you arrive that it just isnt what you ordered - well Villa Frene offers you that great location, and more. Set amid open fields and olive groves with the nearest beach just 900 mts away; Villa Frene has everything you will need for that perfect holiday. On hand you have a private walk-in swimming pool, BBQ and dining area, sun bathing terraces, childrens play area with swing and other play items, enough garden for the largest family to run around in and no immediate neighbours to worry about. Tavernas, shops and nightlife are closeby but with no concrete tourist complexes around you, no busy main roads and no noisy restaurants, you will find it hard to do anything else but relax and enjoy the peaceful, pleasant Cypriot way of life. We are Anna and Kostas and we are the owners of villa frene. I am from cyprus and my husband is from Greece and we leave in cyprus. We are a young couple with 3 children a son 13 years old, 2 twin girls 7 years and a cat 1 years old. We both work here in Paphos and our free time we spend it with our children who we love very much. We haven't bought our villa, we had the land in Yeroskipou and we builded the villa as an investment. We cannot leave in it for the moment so we decided to rent it and give other people the opportunity to enjoy it. The area is ideal because is near the town about 5 minutes away and the airport which is 15 minutes away. Is a very quiet area and is near the beach. When you stay in villa Frene you have the benefit of the quiet area near the town and the tourist area. The town and the tourist area is 5 minutes away with a car about 5 km. Restaurants and bars you can find the nearest by the closest beach which is 800 meters away. 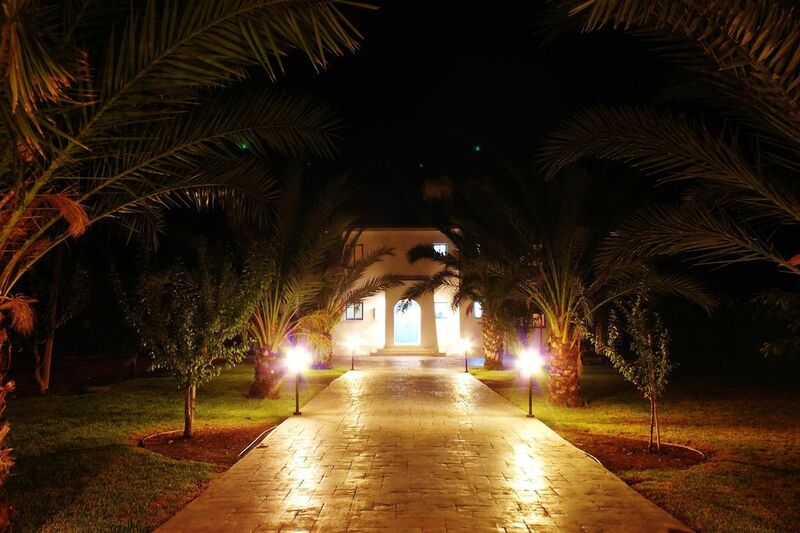 The villa is builded in a 1500 square meters with a big garden with olive trees and other fruit trees. There is a play area in the garden with swings and games for the children. A spacious swimming pool and pool area with sunbeds, umbrellas garden furniture and a bbq. In the area around the villa you can also find the water park, the paintball, a mini golf, go karts and a Luna park with all sorts of games for children. 3 bathrooms. Bathroom 2 - en-suite to master bedroom, toilet, bath with shower. Bathroom 1 - ground floor, toilet, bath with shower. The open-plan lounge/diner is comfortably furnished with a leather suite. Dining table, TV, DVD, stereo. Kitchen is fully equipped with fridge/freezer, oven/hob, washing machine, dishwasher, kettle, toaster, microwave and iron with ironing board. There are three 18 hole golf courses to choose from. Tsada Golf Club which is just 20 minutes from Paphos town, 550 metres above sea level to ensure cool breezes during the summer months. It plays to a par 72 and measures 6,060 meters. The Secret Valley Golf Club is 18 kilometres east of Paphos lying within a scenic valley and offers panoramic views. It plays to a par 72 and measures 6,120 meters. The Aphrodite Hills Golf Complex is a unique up-market experience The Award Winning Golf course is located near to the birthplace of Aphrodite, only 2 mins from the main Limassol-Paphos highway. The course is in a fantastic setting on 2 plateaux, 300m metres high. It plays to a Par 71 and measures 6,665 metres. Outside: Large front garden with plenty of space for children to run around. Private walk-in swimming pool, BBQ and dining area, sun bathing terraces, childrens play area with swing and other play items, enough garden for the largest family to run around in and no immediate neighbours to worry about. Garden furniture, sun loungers and umbrellas. Cleaning / Towels / Linen / Maid service: Towels and linen is provided. For 2 weeks accommodation 1 change of linen/towels and cleaning in the middle of stay. Property had everything we needed. Thank you very much for your review. We are very glad you enjoyed your stay with us. We would be more than happy to see you again for a holiday at our villa Frene. Very clean and comfortable villa. Good swimming pool. Lots of privacy. Very nice land lord. We are very glad that you enjoyed your holiday to our villa Frene and thank you very much for your nice comments. We hope to see you again!!! Good place for a short break. Very good size good facilities nice pool. I little difficult to find. Owner very polite and welcoming. Lots of dogs in the surrounding areas and they tend to bark a lot at night. Overall we were a party of 9 and we enjoyed our time. Thank you very much for staying with us. We are glad you enjoyed your holiday at villa Frene and you are more than welcome to come again!!!! We are more than glad that you enjoyed your holiday at villa Frene. Surely we enjoy having people like you staying with us and you are more than wellcome to repeat a holiday at villa Frene again. Fabulous holiday in the sun. We booked this villa for 3 weeks this summer and invited friends and family to come and stay. Villa Frene was just perfect. Clean and well equipped ( although a second fridge would be good for cold drinks and water) with plenty of space for everyone. Our grandsons loved the pool and play area as did we!! The air conditioning is effective although we only used it in the bedrooms. Kostas was amazing. So friendly and always at the end of the phone if we had a problem. His restaurant The Moorings in Paphos harbour serves great food too! I can also recommend Stevies taxi service. Great value for transporting up to 10 people at a time as the villa is quite a walk from the bus stop in August heat. Being away from the hustle and bustle was a bonus for us. I wouldn't hesitate in booking Villa Frene again. Thank you Kostas and Anna for a fabulous holiday. We are more than glad that you enjoyed your holiday to our villa Frene. It is always our pleasure to ensure that our guests staying at villa Frene will have a wonderful stay. You will be more than welcome to visit us again and it was great meeting you too. This 5 bedroom villa is located less than 1km from the beach of Geroskipou. 10 minutes walk from and 3 minutes with the car. Pafos airport is 12km away. The villa is near to everything but a car hire is advisable. Beach/sea: 1 km, Shop:1.6km, Restaurant:1.6km, Water Park: 500m. Paphos/Kato Paphos 1.5km, Yeroskipou village square 1.6km. Booking Notes: Please contact owner. Changeover Day: Flexible changeover. Check in 2 pm and check out 11 am. Notes on prices: Part payment / deposit - 3 days accommodation as a deposit to secure the booking. Balance / full payment - Upon arrival. Breakage deposit - €300 in cash upon arrival. Air-conditioning in all bedrooms and in living room. Use is optional and is charged extra. Aircondition - each bedroom - €5 per day (payable upon arrival). Aircondition - livingroom - €10 per day (payable upon arrival).